"The crew was polite, professional and punctual. We especially appreciate e-mails notifying us that they were not coming out (due to snow). The walkway is beautiful! We would be happy to serve as a reference for you, Thank you!" "Chuck Dod came up with a unique design using some of our existing materials. His design and his firm's workmanship has opened up our backyard. We look forward to working with him for additional projects." "We really appreciate Chuck's suggestion to use Techo-Bloc products for our replacement patio. The product is excellent and adds tremendous value to our home." "It was a good experience working with C. Dod Landscaping. We are very happy with the work. Chuck is very knowledgeable, and provides options for customer's needs. The quality is very good, and details are taken care of." "Our neighbors are all jealous!! Fantastic job, some of the nicest hard working men we've ever seen, great design! Can't say enough good things. We would recommend you to anyone and please feel free to use us as reference." "Thanks for a great job! We'll be enjoying our new driveway and courtyard for many years." 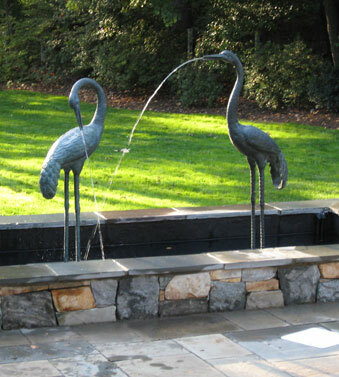 "C. Dod Landscaping is a first-rate landscaping and design firm. I am a realtor and have worked with many such firms before meeting Chuck. He communicates well, asks the right questions and does more than he is expect to do ... and on time! You can tell he is trained in design and spends time working out the best for each project. I love what he did for us and would highly recommend the firm." "We felt Chuck Listened to our requests carefully, made good design suggestions, and provided a clear sketch of the final product. A favorable experience from beginning to end. I would definitely recommend C. Dod Landscaping. We are so excited about our new patio. C. Dod Landscaping did a beautiful job - exceeded our expectations. We also found the production crew to be professional craftsmen." "Chuck, I would like to mention how much my family has enjoyed the landscapes you have created for us. We all especially enjoy our backyard and spend so much more time there than even before! The lighting that was installed, which we have never had before, has proved to be the best value added purchase ever. We stay out longer and enjoy the view of our garden even after dark! We are also enjoying a great surge in the number of birds to the yard and I love my feathered friends. I have seen several hummingbirds this spring, earlier than I have seen in the past. You also know that my son was badly injured in early spring and I can't t tell you how much my beautiful backyard has brought me comfort from the stress of coping with his recovery. Thank you!" "From start to finish, we had an exceptional experience working with Chuck and the crew. We love our new patio and seat wall, including the thoughtful and attractive design, as well as excellent construction. Thank you for your outstanding work!" "My wife and I would like to personally thank you and your professional staff for your hard work, design plan and beautiful installation of our patio. You helped take an idea and make it a reality. The workmanship, attention to detail and quality is exceptional. You and your team were extremely patient and you took the time to explain and to meet with us to make adjustments as needed. You have made our patio a spectacular extension of our home. We are tremendously satisfied with the work performed. As you know, we interviewed a number of firms and asked for proposals. Of all the bids and interviews, you were clearly the best value and easiest to work with. Thanks again for all your support. We will definitely recommend you to our neighbors and friends and invite you back for follow-on work." "LOOK NO FURTHER. C. Dod Landscaping was by far the best home improvement company we have ever used. Chuck has a true vision and knows this region well. His team of experts in the office and in the field were all knowledgeable and polite during every aspect of our project. Our neighbors are happy too! Thanks C. Dod Landscaping!" "Our driveway and landscape were very professionally done, from the initial consultation through the final day of work. We especially appreciated the suggestions Chuck made regarding the landscape. I never would have thought of some of the things he suggested and I was please with all of them. Thank you!" "We are very happy to have selected C. Dod Landscaping over similarly priced competitors. Chuck went above and beyond to get our project permitted and installed. Nelson was always super courteous and had a great attitude towards the work to be done. We will continue to recommend C. Dod Landscaping to everyone! Thanks again for the great work." "Everything about this job was done so well! Your men were courteous and extra helpful! I really appreciate their moving the furniture off the porch and replacing it afterwards! Thank you for a very good experience!" "Quality of Workmanship was excellent! Thank you!" "We appreciate that you were willing to work with us to get the project within our budget. The patio looks great and we are very happy." "Thank you for the excellent work! "An excellent outcome all around. Driveway looks fantastic! "Beautiful work on the patio. We're looking forward to enjoying it when the warm weather returns." "We're please with out new landscaping and can't wait for Spring to see our plants in all their glory! Thanks. "Driveway looks great. Despite rain delays, work proceeded well. Always felt focus of management and crew was on quality and not on meeting an arbitrary schedule, which I appreciate. Management was always cooperative and informative. Thanks. "C. Dod's crew did outstanding work installing our walls, they deserve accolades. All aspects of our project (value, timeliness, cleanliness, pricing, courteousness, communication and quality of work) were excellent. Thanks for fortifying our castle!!!!! Sincere thanks and appreciation." "We are very happy with the quality and timeliness of our patio and walkway. I would not hesitate to recommend C. Dod Landscaping to our friends and the public. We truly believe that our property has gain value as a result of work done by C. Dod Landscaping. Thank you so much! "Thanks for the wonderful job on my retaining walls! I have done many home improvement projects and this was the easiest by far. There were no problems and the work was done quickly. Thanks again for everything. I look forward to our next project." "Excellent work again. Very flexible to work with an adjust to jobsite needs and design. Will recommend to others. Also, plan to use in the future for additional landscaping needs. Many Thanks." Thanks for the great work and your flexibility in adjusting design needs. I plan to use you again for other landscaping projects and will recommend you to all I know. Thanks!" "The end result looks great! "We would highly recommend your work. We are very happy with the results. We appreciated you coming by several times to discuss the project. Thank you. "Thank you for giving us a beautiful and restful backyard. WE LOVE IT and look forward to enjoying it for many years." "This project came out very well. Based on the nice looking results of work performed on a neighbor's property, I requested a visit and a work and cost estimate from C. Dod Landscaping. My questions and concerns about details in the initial work contract were address completely. Start-up instructions on the first day were provided by Mr. Charles Dod. The crew executed the concrete and flagstone work very professionally. As a result the front walkway, steps, and stoop are beautiful additions to our house. We have had many compliments and requests for information from our neighbors." "The service and quality of work of Nelson and his team are outstanding! I need to come up with more projects just to have your team here"
"Great job on the wall. Thank you for being responsive in addressing my inquiries. The wall looks great and we're excited to get the trampoline in place this weekend!" "We are so pleased with our new outdoor room. It is such a relief to see a unified landscape out of our living room windows. We were also very pleased to have Chuck design with our own garden in mind, making a completed look that we can really enjoy. I can't wait to finish the front yard next year." "I cannot believe how beautiful our front porch area looks with the new walkway and plants. Your men were exceptional - particularly on the 97 degree day! We'll be calling again soon." "We have received multiple compliments on our new stairs and patio. We are so pleased." "The crew was very professional, hard working and polite. The work was outstanding; it really improved the appearance of my home. The work done was timely, completed within the couple of days scheduled. THANK YOU!" "We have used four other landscaping companies since we moved into this house and your work and your company is the first that we have been happy with! Everything looks great. Thank you. We will definitely use you again and recommend you!" "We came back to C. Dod for landscaping because of the quality of work done when they installed our patio. The crew was great, thorough, clean and did a beautiful job with the landscape. Chuck was great in laying out our design plan, providing ideas and expertise. Thank you for a great job!!!!!" "I am extremely pleased with all aspects of the work performed. Given the weather conditions, Nelson always kept me up to date on what the schedule would look like. Even when the roofing was done at the same time, he was able to work with and around them. Excellent job all around!!!" "We are very pleased with all the projects that C. Dod Landscaping has completed for us during the last 3 years. This includes the driveway with pavers, rock retaining walls, back yard landscaping and total landscaping of the front yard. All the workers have been well-trained and courteous. We commend Chuck for his creative designs and excellent plant selection! We greatly appreciate the follow-up and servicing of any issues/questions. C. Dod Landscaping is doing all the right things and we are very happy with the beautification of our landscape. Thank you all!" "Superb work - it looks beautiful and we love it! Excellent design, very professional service - another great experience. Thanks so much." "Wonderful experience! Thanks so much!" "We just love the driveway and the tree and the mulched areas you all did for us! It makes such a difference when you approach our house now and the curb appeal is wonderful. Your crew from start to finish was wonderful, professional, nice and even fun to talk to. They were courteous and kept everything as neat as possible and did a great job cleaning up at the end of each day. Thanks so much and maybe one day you can build us a patio in the backyard. I would definitely hire you again for any future work we may have and of course recommend you to friends and neighbors, who by the way have been complimenting the work every day. Have a great summer and thanks so much again,"
"I think that your teams are tops! Thank you for a very professional job, well done." "We love the work you did in our back yard, the patio and stone stairs look great. The lighting is amazing! We love to sit around the fire-pit, listen to the fountain and enjoy a glass of wine. You did such a great job in the front yard I didn't think you could top yourself in the back but you did! The plants you chose are beautiful and blend well with our wooded back yard. [Your foreman] takes a great deal of pride in his job and it shows. He is so easy to work with and it's clear that he wants to make your clients happy. My neighbors enjoy the front yard as much as we do! Anyone who hires you will be assured of an outstanding design and professional installation." "Thank you so much for the wonderful work. Could you please send a copy of the planting plan? Maureen and I want to know the names of everything you planted." "Thank you for your creativity and professionalism. We know we will be working with you guys again! Jose was Great to work with." "Thank you for a great job. Everyone who attended our Holiday party was impressed with the design and the quality of materials, workmanship and plants. We look forward to you landscaping and building the patio in the back yard in 2011." "C. Dod Landscaping is a top-notch landscaping and design firm. I was impressed with Chuck from the first time he came by to discuss our project. He was thoughtful, asked the right questions, and gave an air of quiet confidence - he's not salesy and will suggest a plan that makes sense for the style of your home and your budget. He is trained in design and it shows. He spent two hours outside our property drafting a plan for us - he doesn't hand the work off to a junior associate. The project turned out beautifully - we are very pleased with the quality and execution. Jose, his foreman, is great and takes pride in his work. Highly recommended!" "Last week your landscaping crew led by Jose, completed the Russell Rd. retaining wall. Your creative design was professionally executed resulting in a product that could be showcased in any magazine. The implementation of the project was done in a polite and cooperative manor. The clean up and construction mateials were always neat and complete. We are extremely pleased with the end product. Thank you for your creative vision for our 30 year old home and wall. You have introduced us to a beautiful new side of our home here in Woodbridge. We look forward to calling you again for help with the front walk in the future." "Veerle and I are very pleased with how the patio turned out. The design is elegant and it seems that we have gained enormous new space that we look forward to enjoying. From the practical standpoint, last night’s heavy rains showed how well the new patio moves water away from the house. Special thanks to Jose’ and his crew for their meticulous work. I was at home to watch much of their work and I was impressed by their attention to detail and efficiency. Jose’ was polite and helpful, repeatedly offering to answer any of my questions and to describe the work he and his crew were doing. They kept the site tidy and did a nice job restoring the area around the patio when they were done. Veerle and I plan to seek help with landscaping over the coming years and will certainly reach out to you again when the time comes." "Thank you for the beautiful paver driveway. We are very pleased with the design, workmanship and timely completion. Nelson, the foreman, was very easy to work with and his helpers were diligent and polite. We enjoyed working with you and would recommend your company to others." "Just wanted to let you know that Jim and I are so pleased with the way our patio and sitting wall turned out. Now the real sweat-equity starts with planting the embankment. If you're in the neighborhood, feel free to stop by and see the progress. You and your guys were great to work with. Thanks for making it a good experience with a very nice outcome!" "WOW! The patio looks fantastic! We couldn't be more pleased. Chuck, the design turned out perfect and is exactly what we wanted. We love the color and, well, everything about it. Nelson and the crew did a great job…please send them our thanks. They were courteous, professional, and clean. Mark really appreciated Nelson's help on the phone this morning. And they got it done in record time! "I am thrilled with the patio – the design, workmanship, progress, etc. A first rate company with a high level of expertise and talent. I didn’t think it could be so seamless.